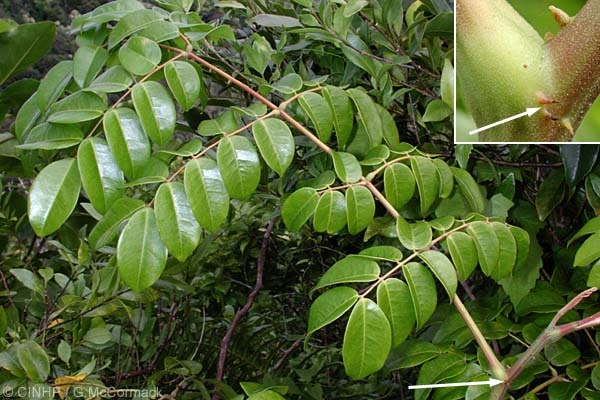 KEY FEATURES: Climber or sprawling shrub to 15m. STEM with recurved thorns. 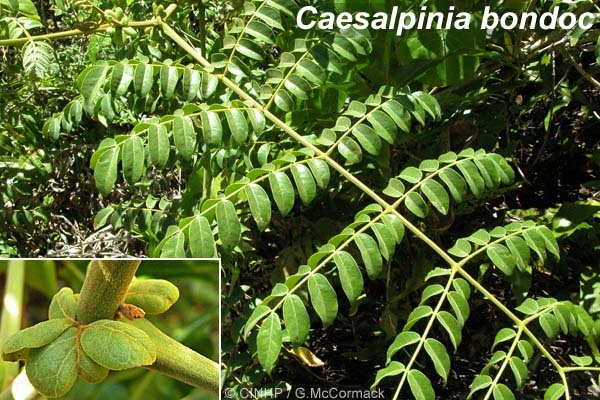 LEAVES alternate, prickly, compound with 3-5 pairs side-stalks (=pinnae) to 10cm with 4-7 ~pairs of leaflets; LEAFLETS oval to 7x4cm, edge smooth, tip sharp, base round. LEAF STIPULE very small, slender, to 3mm. FLOWERS sexes separate on same plant; long axillary clusters, yellow. FRUIT oval pods, to 13x6cm, with nasty prickles (to 10mm). SEEDS dull grey, 2-4, round, very hard. 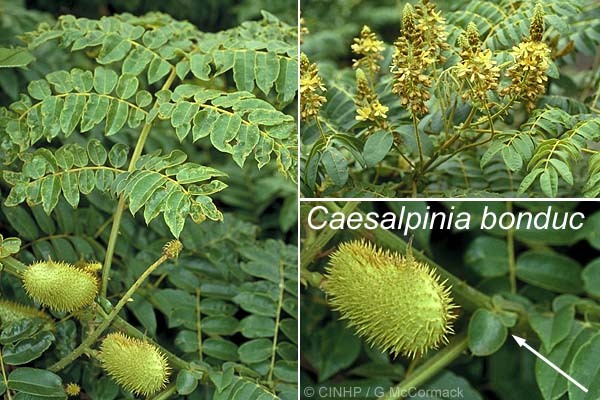 SIMILAR SPECIES: Grey Nickernut (Caesalpinia bonduc) has stipules leaf-like to 25mm (vs. slender to 3mm); leaf-sidestalks with leaflets 6-12 pairs (vs 4-7 pairs); seeds 1-2 (vs 2-4) - widespread in Polynesia but not known within Cook Islands. POSITIVE SIGNIFICANCE: games (formerly). Comments: Seeds formerly used as marbles (by children). Mauke: field specimen by Vae Oti, NBSAP 3/2001, makatea, ID GMcC.